Your Brain at Work by David Rock. This book was an excellent read for me as I started to become curious about Neuro coaching. This fable format tells the story of a husband and wife and what happens in their brains as they survive and succeed at work and home. The brain manages large quantities of information that people are presented with each day and the book discusses ways to feel energized with the day to day challenges of life. Coaching with the Brain in Mind by David Rock. This book opened my eyes to what happens neurologically to a person when being coached. I remember reading this book years ago and taking copious notes and flagging pages to capture the great lessons! This is a great guidebook to help understand brain-based coaching. Case studies and diagrams in this book help the reader to understand key points while not needing to work in the field of neuroscience. What Got You Here Won't Get You There by Marshall Goldsmith and Mark Reiter. This book talks about how as leaders move up in organizations, they need to be aware that behavioral issues vs. technical ones are often what separates the exceptional from the good. There are key points about the importance of simple habits like saying thank you, apologizing, and listening, and the importance of a leader wanting to change. A great read for emerging leaders or those who coach or manage them. 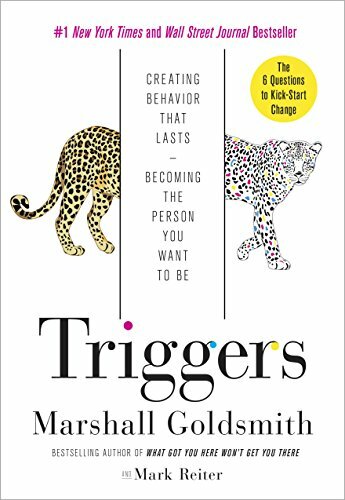 Triggers: Creating Behavior that Lasts - Becoming the Person You Want To Be by Mark Reiter and Marshall Goldsmith. A trigger is an “impulse or catalyst that stimulates behavior or action.” In order to improve ourselves, we need to take action. What challenges us from changing is “overconfidence, stubbornness, confusion and magical thinking.” Learn more about your triggers (help your clients understand their own) through insights in this book. Transitions: Making sense of Life's Changes by William Bridges. In this classic book, Bridges shares the three phases that people go through with transitions which include Endings, Neutral Zone, and New Beginnings. Change is situational; it is the external event that is taking place whereas Transition is the inner psychological process that people go through as they come to terms with the new situation that the change brings about. This excellent book helped me to better understand what my coaching clients are going through with change and transition. Search Inside Yourself: The Unexpected Path to Achieving Success, Happiness (and World Peace) by Chade-Meng Tan and Daniel Goleman. I recommend this book for self-coaching and self-improvement. I have read it twice, and appreciate the insight and focus on mindfulness as a key factor in success. Tan and Goleman state that the three steps to search inside yourself include: 1) Attention training; 2) Self-knowledge and self-mastery; and 3) Creating useful mental habits. Having developed this program originally while working at Google, Tan went on to write this great book and develop a leadership institute and training for the public. What are your favorite coaching books?